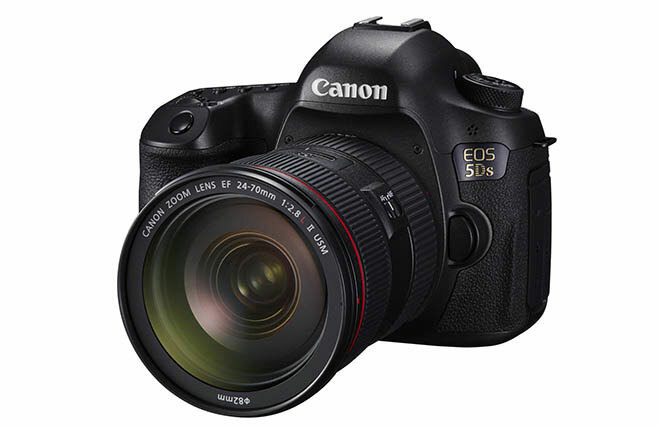 Canon is expected to announced the EOS 5DS and the EOS 5DS R full-frame DSLR cameras this week. The specifications for both models have already been leaked. Both models have 50.6 megapixel full-frame CMOS sensor, 61 point AF system with 41 points being cross-type, dual DIGIC 6 processor, ISO 100-6400 range (expandable to ISO 50 – 12800), 5fps burst mode, 1.3x and 1.6x crop modes, 100% field of view, 150,000 pixel RGB-TR metering sensor, 252 zone TTL metering, 1080p30 video, mini HDMI output, microphone input, and 3.2-inch LCD with 1.04 million dot resolution. The only difference between the two models is that while the 5DS has a low pass filter, the 5DS R does not. For more information and complete spec list, check the source link below.